Renovations to the kitchen, bathroom and living areas compliment the spaciousness of the home. The home consists of 2 very large bedrooms with the main bedroom having triple built in robes. 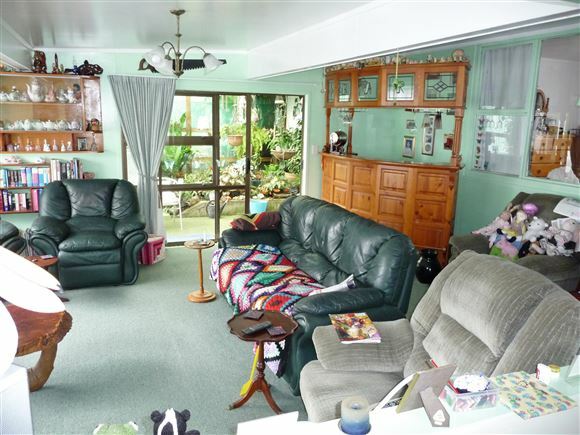 A very spacious open plan living room that leads to the covered atrium and BBQ area. Features of the home include a modern fully renovated kitchen and separate dining room, renovated modern bathroom and a large laundry room that has a bath and room for the freezer. Set on a flat section of over 1,400 square metres and has a shed area consisting of a lock up garage, 2 carports, wood shed, covered fisherman's corner complete with sink and smoke house and a lined building used as a studio/office. The home is surrounded by lush lawns and gardens,a good range of fruit trees and raised gardens beds for the vege patch. Located near the Oruru bowling club (walking distance) on a sealed road and less than 10 minutes to Taipa. Doubtless Bay is renowned for its fantastic Snapper fishing (Arguably the Best in New Zealand) and the gateway to the Marlin grounds. Amenities; Doctors Dentist, Chemist, supermarket are all in Coopers Beach less than 15 minutes drive and Kaitaia (Airport, Hospital etc ) is within a 30 minute drive.